Air France has always been dedicated to the well-being of families travelling on its flights and does all it can to provide a fun experience for kids while guaranteeing a stress-free trip for their parents. With 1,400,000 little ones travelling on its flights every year, including 300,000 travelling alone, but very well accompanied, Air France is constantly innovating with just one aim: to make flying off on holiday fun. "Mind" is a meditation programme designed to help children and parents relax on board and introduce them to the benefits of concentration and serenity. In total, twelve meditation initiation programmes are available in 4 languages as part of the inflight entertainment offer: six contents for children over the age of four, from Eline Snel's best-selling book "Sitting still like a frog", and six guided sessions for adults. Children can learn how to perform magic tricks on Air France long-haul flights. An Air France steward, who is also a magician, has created tutorials as part of the inflight entertainment programme. All the tricks are done with things the kids can find in their games kit given to all the children on the flight. They will be able to impress their parents without leaving their seat ... Magic! Two new games kits are available on long-haul flights for children aged 3 to 8 years. In addition to a colouring book and colouring pencils, our young travellers will also find a magnetic photo frame, an anti-stress ball and small collectible animals. By downloading the "Air France Kids" app before departure, parents can bring their budding artists' drawings to life in 3D. Among the many toys and games inside their kits, children will find a postcard to colour in with an exclusive new game. On one side, there's an aircraft flying over a landscape to colour in, and on the other side, a download link to an original Kids app. By downloading the "Air France Kids"* app before their trip on the family's tablet or smartphone, children can bring their colourful aircraft to life in three dimensions by taking a photo of it! In addition, by "flashing" certain parts of the 3D card in the app, they can also collect stickers and reprint the original drawing at home to colour it in again. *App available on App Store and Google Play. A fun tutorial for the game is available at www.airfrance.fr. As soon as they arrive at the airport, Kids Solo are welcomed by Air France agents and remain under the responsibility and constant supervision of airline staff until their arrival at their destination. During the flight, children receive as much, if not more attention from the flight attendants and have access to the same services as all the other Kids on board. Tracking their trip in real time and a photo to show they've arrived!To give parents peace of mind and simplify their child's journey, Air France has developed a tailor-made service on its "Air France" app. On their tablet or smartphone, parents can book tickets for young passengers, access and modify their reservations and also monitor their child's trip in real time, from check-in to boarding and take-off to landing. This information can also be shared with the person waiting for the child at destination, who can even send a photo via the app when the child arrives. 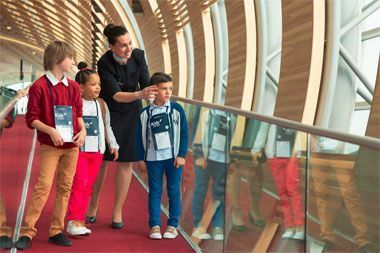 At Paris-Charles de Gaulle, terminal 2EL, the company welcomes all children travelling alone with a connecting flight of more than two and a half hours in a new connected and fun place entirely dedicated to them. Under the supervision of Air France agents, several different areas allow them to spend their waiting time in the best possible conditions: a rest area after a long-haul flight, a games room for 5-9 year-olds, a lounge with a library, TV and USB sockets, play areas for teenagers with Sony PS4 terminals, a touch screen games table, table football and, of course, free Wi-Fi. To celebrate a child's first trip or for their birthday, the crew members will give them a special certificate for an unforgettable souvenir of their trip. With "Air France Play", the company's digital kiosk, kids can download free content adapted to their age and language. 8 magazines in French, English, German and Spanish are available 30 hours before the flight. A new comfort kit is available for families travelling with young babies on all long-haul flights in the La Première, Business and Premium Economy cabins. It contains a bib, a cuddly toy, a spoon, a diaper, as well as wipes and a Nivea Baby moisturizing cream. Losing your teddy when you travel is unimaginable. Air France knows this and has published the My Teddy tag, available at the check-in counter. Attached to the teddy with a rubber band, it contains the young traveller's contact details and flight number. If teddy gets lost or forgotten at the airport, it's easy to reunite teddy with its young owner. For all infants from 6 to 24 months, Air France offers a special meal tray with a small jar of savoury food, a jar of dessert, milk and finger biscuits. The savoury and dessert jars are organic, for optimum well-being. This meal tray must be ordered by the parents at the latest 24 hours before flight departure. The company also offers a children's meal tray adapted to the tastes and needs of the youngest travellers. It is designed to be balanced, fun and easy to eat (meat cut into small pieces, fruit purée for dessert...). Made up of a fresh salad, a hot dish, a piece of fruit or a fruit salad, it is also contains organic treats: orange juice, fruit purée and a chocolate bar. Αναρτήθηκε από geop στις 9:34 π.μ. Blogger 14 Ιουλίου 2018 - 10:13 π.μ.